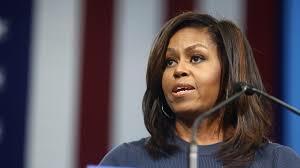 Sans hésiter un instant, j’ai choisi de reproduire le puissant discours que Michelle Obama a prononcé au New Hampshire en faveur de Hillary. J’y joins le témoignage d’un partisan de Trump pour faire bonne (dé)mesure. Ces élections, nous le savons tous sont déterminantes pour l’avenir des States et de l’humanité. WELL, LET ME JUST SAY HELLO EVERYONE. I am so thrilled (excited) to be here with you all today in New Hampshire. This is like home to me, and this day — thank you for a beautiful fall (autumn) day. You just ordered this day up for me, didn't you? It's great to be here. So I'm going to get a little serious here, because I think we can all agree that this has been a rough (rude) week in an already rough election. This week has been particularly interesting for me personally because it has been a week of profound contrast. On Tuesday, at the White House, we celebrated the International Day of the Girl and Let Girls Learn, and it was a wonderful celebration. It was the last event that I'm going to be doing as First Lady for Let Girls Learn. And I had the pleasure of spending hours talking to some of the most amazing (surprenant) young women you will ever meet, young girls here in the U.S. and all around the world. And we talked about their hopes and their dreams. We talked about their aspirations. See, because many of these girls have faced unthinkable obstacles just to attend school, jeopardizing (menacing) their personal safety, their freedom, risking the rejection of their families and communities. So I thought it would be important to remind (rappeler à ) these young women how valuable and precious they are. I wanted them to understand )that the measure of any society is how it treats its women and girls. And I told them that they deserve (mériter) to be treated with dignity and respect, and I told them that they should disregard (mépriser) anyone who demeans or devalues them, and that they should make their voices heard in the world. And I walked away feeling so inspired, just like I'm inspired by all the young people here — and I was so uplifted (enthousiasmée, soulevée) by these girls. That was Tuesday. And now, here I am, out on the campaign in an election where we have consistently (systématiquement) been hearing hurtful (blessant), hateful language about women — language that has been painful for so many of us, not just as women, but as parents trying to protect our children and raise (élever) them to be caring (protéger), respectful adults, and as citizens who think that our nation's leaders should meet basic standards (critère) of human decency. The fact is that in this election, we have a candidate for President of the United States who, over the course of his lifetime and the course of this campaign, has said things about women that are so shocking, so demeaning (degradant) that I simply will not repeat anything here today. And last week, we saw this candidate actually bragging (fanfaronner) about sexually assaulting women. And I can't believe that I'm saying that a candidate for President of the United States has bragged about sexually assaulting women. And I have to tell you that I can't stop thinking about this. It has shaken (secouer) me to my core (mon for intérieur) in a way that I couldn't have predicted. So while I'd love nothing more than to pretend (faire comme si) like this isn't happening, and to come out here and do my normal campaign speech, it would be dishonest and disingenuous to me to just move on to the next thing like this was all just a bad dream. This is not something that we can ignore. It's not something we can just sweep under the rug (carpette) as just another disturbing footnote (detail, note de bas de page) in a sad election season. Because this was not just a "lewd (obsène)conversation." This wasn't just locker-room (vestiaire) banter (plaisanterie). This was a powerful individual speaking freely and openly about sexually predatory behavior, and actually bragging (se vanter) )about kissing and groping ( peloter)women, using language so obscene that many of us were worried about our children hearing it when we turn on the TV. It is cruel. It's frightening. And the truth is, it hurts. It hurts. It's like that sick, sinking feeling you get when you're walking down the street minding your own business and some guy yells out (hurler) vulgar words about your body. Or when you see that guy at work that stands just a little too close, stares (fixer du regard) a little too long, and makes you feel uncomfortable in your own skin. It's that feeling of terror and violation that too many women have felt when someone has grabbed them, or forced himself on them and they've said no but he didn't listen — something that we know happens on college campuses and countless other places every single day. It reminds us of stories we heard from our mothers and grandmothers about how, back in their day, the boss could say and do whatever he pleased to the women in the office, and even though they worked so hard, jumped over every hurdle (barrière , obstacle) to prove themselves, it was never enough. We thought all of that was ancient history, didn't we? And so many have worked for so many years to end this kind of violence and abuse and disrespect, but here we are in 2016 and we're hearing these exact same things every day on the campaign trail (campagne électorale). We are drowning (se noyer) in it. And all of us are doing what women have always done: We're trying to keep our heads above water, just trying to get through it, trying to pretend like this doesn't really bother us maybe because we think that admitting how much it hurts makes us as women look weak. Maybe we're afraid to be that vulnerable. Maybe we've grown accustomed to swallowing (ravaler) these emotions and staying quiet, because we've seen that people often won't take our word over his. Or maybe we don't want to believe that there are still people out there who think so little of us as women. Too many are treating this as just another day's headline (titre d’article de presse), as if this is normal, just politics as usual. But, New Hampshire, be clear: This is not normal. This is not politics as usual. This is disgraceful. It is intolerable. And it doesn't matter what party you belong to — Democrat, Republican, independent — no woman deserves (mérite) to be treated this way. None of us deserves this kind of abuse. And I know it's a campaign, but this isn't about politics. It's about basic human decency. It's about right and wrong. And we simply cannot endure (endurer) this, or expose our children to this any longer — not for another minute, and let alone for (surtout pas) four years. Now is the time for all of us to stand up and say enough is enough. This has got to stop right now. Because consider this: If all of this is painful to us as grown women, what do you think this is doing to our children? What message are our little girls hearing about who they should look like, how they should act? What lessons are they learning about their value as professionals, as human beings, about their dreams and aspirations? And how is this affecting men and boys in this country? Because I can tell you that the men in my life do not talk about women like this. And I know that my family is not unusual. And to dismiss this as (rejeter comme) everyday locker-room talk is an insult to decent men everywhere. The men that you and I know don't treat women this way. They are loving fathers who are sickened (écoeuré) by the thought of their daughters being exposed to this kind of vicious language about women. They are husbands and brothers and sons who don't tolerate women being treated and demeaned and disrespected. And like us, these men are worried about the impact this election is having on our boys who are looking for role models of what it means to be a man. In fact, someone recently told me a story about their six-year-old son who one day was watching the news — they were watching the news together. And the little boy, out of the blue (de but en blanc), said, "I think Hillary Clinton will be President." And his mom said, "Well, why do you say that?" And this little six-year-old said, "Because the other guy called someone a piggy, and," he said, "you cannot be President if you call someone a piggy." Because let's be very clear: Strong men — men who are truly role models — don't need to put down women to make themselves feel powerful. People who are truly strong lift others up. People who are truly powerful bring others together. And that is what we need in our next President. We need someone who is a uniting force in this country. We need someone who will heal (guérir) the wounds that divide us, someone who truly cares about us and our children, someone with strength and compassion to lead this country forward. See, we know that Hillary is the right person for the job because we've seen her character and commitment (engagement) not just in this campaign, but over the course of her entire life. The fact is that Hillary embodies (incarner) so many of the values that we try so hard to teach our young people. We tell our young people "Work hard in school, get a good education." We encourage them to use that education to help others — which is exactly what Hillary did with her college and law degrees, advocating (plaider la cause de) for kids with disabilities, fighting for children's health care as First Lady, affordable (accessible financièrement) child care in the Senate. We teach our kids the value of being a team player, which is what Hillary exemplified when she lost the 2008 election and actually agreed to work for her opponent (adversaire) as our Secretary of State — earning sky-high approval ratings serving her country once again. We also teach our kids that you don't take shortcuts (raccourcis) in life, and you strive (aspirer à) for meaningful success in whatever job you do. Well, Hillary has been a lawyer, a law professor, First Lady of Arkansas, First Lady of the United States, a U.S. senator, Secretary of State. And she has been successful in every role, gaining more experience and exposure to the presidency than any candidate in our lifetime — more than Barack, more than Bill. And, yes, she happens to be a woman. And finally, we teach our kids that when you hit (faire face à) challenges in life, you don't give up, you stick with it (on s’y tient, on tient bon, on mord sur sa chique). Well, during her four years as Secretary of State alone, Hillary has faced her share of challenges. She's traveled to 112 countries, negotiated a ceasefire, a peace agreement, a release (libération) of dissidents. She spent 11 hours testifying (témoigner) before a congressional committee (commission). We know that when things get tough (rude), Hillary doesn't complain. She doesn't blame (accuse, render coupable, blamer) others. She doesn't abandon ship for something easier. No, Hillary Clinton has never quit on anything in her life. So in Hillary, we have a candidate who has dedicated her life to public service, someone who has waited her turn and helped out while waiting. She is an outstanding (excellente) mother. She has raised a phenomenal young woman. She is a loving, loyal wife. She's a devoted daughter who cared for her mother until her final days. And if any of us had raised (élever) a daughter like Hillary Clinton, we would be so proud. We would be proud. And regardless of (peu importe qui…) who her opponent might be, no one could be more qualified for this job than Hillary — no one. And in this election, if we turn away from her, if we just stand by (rester passif) and allow her opponent to be elected, then what are we teaching our children about the values they should hold, about the kind of life they should lead? What are we saying? In our hearts, we all know that if we let Hillary's opponent win this election, then we are sending a clear message to our kids that everything they're seeing and hearing is perfectly okay. We are validating it. We are endorsing (approuver) it. We're telling our sons that it's okay to humiliate women. We're telling our daughters that this is how they deserve to be treated. We're telling all our kids that bigotry (préjugés , sectarisme) and bullying (harcèlement)are perfectly acceptable in the leader of their country. Is that what we want for our children? And remember, we won't just be setting a bad example for our kids, but for our entire world. Because for so long, America has been a model for countries across the globe, pushing them to educate their girls, insisting that they give more rights to their women. But if we have a President who routinely degrades women, who brags about sexually assaulting women, then how can we maintain our moral authority in the world? How can we continue to be a beacon (une balise) of freedom and justice and human dignity? Remember this: In 2012, women's votes were the difference between Barack winning and losing in key swing states (Etat clé), including right here in New Hampshire. So for anyone who might be thinking that your one vote doesn't really matter, or that one person can't really make a difference, consider this: Back in 2012, Barack won New Hampshire by about 40,000 votes, which sounds like a lot. But when you break that number down, the difference between winning and losing this state was only 66 votes per precinct. Just take that in. If 66 people had gone the other way, Barack would have lost. So each of you right here today could help win this election for Hillary just by getting yourselves, your families, and your friends and neighbors out to vote. You can do it right here. But you could also help Hillary's opponent with a protest vote or by staying home out of frustration. And, young people and not-so-young people, get on social media. Share your own story of why this election matters, why it should matter for all people of conscience in this country. There is so much at stake (en jeu) in this election. So we cannot afford (se permettre) to be tired or turned off. And we cannot afford to stay home on Election Day. Because on November the 8th, we have the power to show our children that America's greatness comes from recognizing the innate dignity and worth of all our people. On November the 8th, we can show our children that this country is big enough to have a place for us all — men and women, folks of every background and walk of life — and that each of us is a precious part of this great American story, and we are always stronger together. On Nov. 8, we can show our children that here in America, we reject hatred (haine) and fear and in difficult times, we don't discard (rejeter) our highest ideals. No, we rise up to meet them. We rise up to perfect our union. We rise up to defend our blessings of liberty. We rise up to embody the values of equality and opportunity and sacrifice that have always made this country the greatest nation on Earth. C’est aussi beau que le discours du Caire de son mari. Avant de conclure, lisez également ce qu’écrit à un ami suisse un couple d’américains middle class apparemment très frustrés par les années Obama.